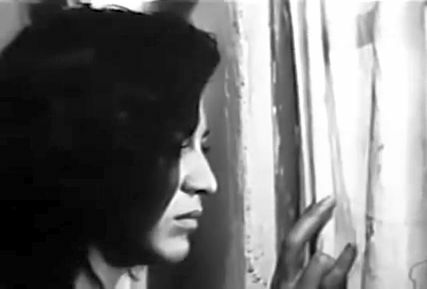 Ebrahim Golestan’s remarkable first dramatic feature, The Brick and the Mirror (Khesht va Ayeneh, 1965), is sometimes seen as a groundbreaking early work of modern Iranian cinema. But I would go further and say it stands as one of the great films on any world stage. It certainly deserves a wider viewing audience if a digitally restored version of the print can be made available. Golestan, born in 1922, established himself early on as a writer, translator, photographer, and documentary filmmaker [1,2]. He set up his own film production company in 1956, and in 1958 met and hired the brilliant young woman poet Forough Farrokhzad, who aspired to be a filmmaker and with whom he began a romantic and working partnership that continued until her tragic death nine years later . 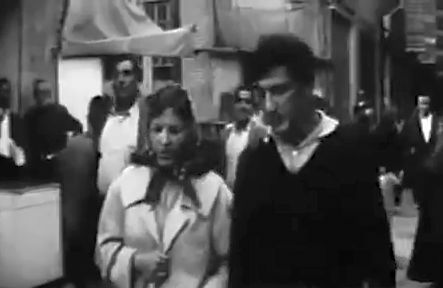 They collaborated on her mesmerizing documentary film, The House is Black (Khaneh Syah Ast, 1962) and soon began working together on Golestan’s initial feature film, The Brick and the Mirror, in 1963. They started production shooting with only the first nightmarish scene in script form, and they improvised the rest of the narrative as they went along . Given some of the film’s interesting personal thematic elements, I suspect that Farrokzhad’s’ contributions to the story were significant . 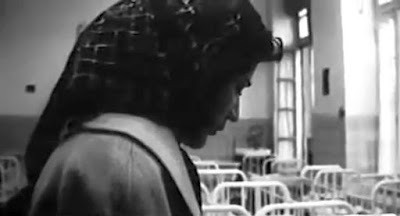 The story of the film concerns a taxi driver in Tehran who discovers that a woman passenger (played by Forough Farrokhzad) has left a small baby in the backseat of his cab. After his frantic attempts to track down the woman fail, he is faced with the problem of what to do with the child. The rest of the film is concerned with his efforts to do the right thing and at the same time stay out of trouble. The loneliness of the nocturnal urban milieu evoked in the early scenes of the film may remind some viewers of past American movies set in the “asphalt jungle”, and indeed Tehran was a rapidly growing metropolis going through the same depersonalization processes that had beset cities the world over. Given the city’s underdeveloped mass transit facilities at the time, the streets were crowded with cars and taxis, and being a taxidriver there was a reasonably lucrative, if exhausting, way for an uneducated man to make a living. But taxi drivers were also perpetual witnesses to the stress and alienation of the big city. Perhaps from considerations along these lines, some reviewers see The Brick and the Mirror as being concerned with social issues in pre-revolutionary Iran . But for me the film’s themes run more along existentialist lines, and a more interesting comparison would be to Taxi Driver (1976). In fact given that both Taxi Driver’s director, Martin Scorcese, and its scriptwriter, Paul Schrader, were graduates of famous academic film schools, I wonder if they had been exposed to and influenced by The Brick and the Mirror prior to the making of their film. In some ways, though, The Brick and the Mirror concerns more universal aspects of existence even than Taxi Driver, and to me it had perhaps greater affinities with Antonioni’s L’Avventura (1960). Both L’Avventura and The Brick and the Mirror are primarily concerned with love and what it means to love. And the ways they explore and engage us concerning this topic are what makes them both great films. A key aspect to any love concerns commitment: to what extent is one going to permanently lock down his or her life and devote it to one person. Given the ephemerality of most love relationships, young people are understandably cautious on this score. But commitment is not just something concerned with love; it is a major issue with respect to all of modern life. Given the relatively higher degree of autonomy that modern people have, they need to consider their options carefully at all times. Keeping one’s options open for as long as possible means keeping the door open to making a decision later in the day, when more information is available to make the right decision. So delaying commitment is a recommended strategy in connection with many modern activities. In particular, the strategy of delaying commitment is a recognized optimal policy in the field of software engineering . If we can build a software module with a minimally prescribed interface; then we are only committed to the interface, and we can change the module’s internals further on down the line. Of course we can delay commitment, but we cannot avoid it forever. At some point we must seize the opportunity and engage. So young men, in particular, are often committed to delaying commitment, and this goes for romantic relationships as well as everything else in life. The idea is to keep your options open and make sure that you do not get locked into a disastrous situation. Being a taxidriver is a perfect occupation along these lines. The driver just takes on short transport jobs and is only committed for the term of that ride. This way, he doesn’t get locked into an unbearable position. This is the world view of the main character, Hashem, in The Brick and the Mirror. The story of the film is told in ten scenes that can be grouped into four acts. Acts 1 and 3 focus on the protagonist Hashem’s concerns about delaying commitment. Acts 2 and 4, on the other hand, emphasize, by means of Hashem’s interactions with his girlfriend Taji, the importance of seizing the opportunity, which is the countervailing option to delaying the commitment. In the opening atmospheric night scene the taxidriver Hashem (played by Zackaria Hashemi) takes a woman wearing a chador (a full veil – many middle class women did not wear the chador at this time in Iran) to a dark urban area and drops her off. After she disappears into the night, he realizes that the woman left a baby in the backseat of his cab. He runs after her with the baby and comes upon an abandoned building project, but he cannot find her. Instead he only encounters a couple of lost souls and a forsaken woman who seems to be on the edge of madness. Not knowing what to do with the abandoned baby, Hashem visits his customary evening hangout, a local nightclub, where his usual drinking companions are gathered. This gang of Damon Runyonesque characters immediately offers him their views on what to do: disengage. They swaggeringly tell him the whole thing is likely to be a trap, and if he tries to find the baby’s mother, he will only get into trouble. One young pal, with a more intellectual bent, waxes eloquently on the virtues of concealing the truth with lies. All in all, they are telling him to avoid commitment and to keep his options open. So Hashem takes the baby to the police station, but the officers there offer him no support. They are only committed to doing the minimal as defined by the law. Doing the “right thing” is not their concern, it is only a matter of identifying and punishing who is guilty. Coming out of the police station and still carrying the baby, Hashem meets his girlfriend Taji (Taji Ahmadi), who had been briefly seen earlier at the nightclub. They argue about what to do with the baby, until Hashem finally accepts that she can come over to his flat for the evening and help him look after the baby. The 32-minute scene in Hashem’s one-room apartment is beautifully done – it is shot mostly from a low angle and is a film highlight. Here the story focusses on Taji’s compassionate engagement with the baby and with Hashem, and Taji Ahmadi’s performance in the role is beautiful. Taji emerges as the narrative counterweight to Hashem and becomes an equal protagonist. Hashem loves Taji, but it only for the present moment; there is no commitment for tomorrow. He has too many practical concerns to worry about: his limited funds, the always-watchful and intrusive neighbors, and the dangers lurking around the next corner. For her part, Taji loves Hashem, but for her it is different – it is all the way. She wants to cast her fate to a life with him. And she feels the baby offers them a heaven-sent opportunity to engage together deeply with life. There is a beautiful two-minute shot of Taji, with Hashem’s help, attending to the baby. 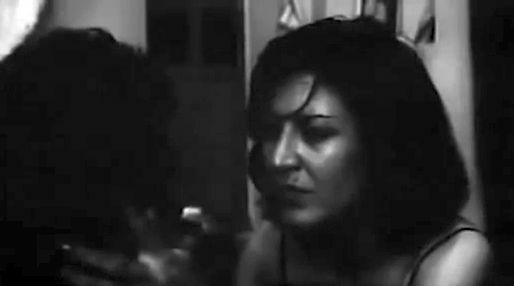 Then there is an extended scene of the two of them in bed in the dark – wonderfully performed and unusual in Iranian cinema. Taji later tells Hashem that the baby watched them making love and approved, thereby confirming and sealing their family union. In the morning Hashem is shown self-absorbedly doing his daily bodybuilding exercises by swinging traditional meel weights. He then goes out with the baby, telling Taji not to go out of the apartment alone during daylight, when nosey neighbors might see her and draw dark conclusions. Hashem takes the baby to a hospital, but they won’t accept her unless she is proven to have no identified parents. Like the police, they don’t want to engage with Hashem’s human problem; they already have too many problems with abandoned babies to deal with. So he has to go to the government law offices and seek an affidavit verifying the baby’s parentless situation. At the government tribunal offices, there is an extended montage showing Hashem wandering from room to room looking for the right person to talk to. He finally approaches a well-dressed and clearly lettered man filling out a form at a public writing stand, and he asks the man if he would write a letter for him. It as at this point that Hashem is revealed to be functionally illiterate. Hashem wants the man to write him a formal letter to the tribunal office requesting authority to adopt the baby. Being unmarried, he cannot mention Taji in the application letter, and so he has to ask if he can adopt the baby on his own. Anyway, momentarily at least, he seems to have succumbed to Taji’s wishes. However, the lettered man dismisses Hashem’s plans as foolhardy. Raising a baby is only trouble, he tells him, and it will diminish his freedom. Again, as in Act 1, Hashem gets a strong warning to avoid commitment. 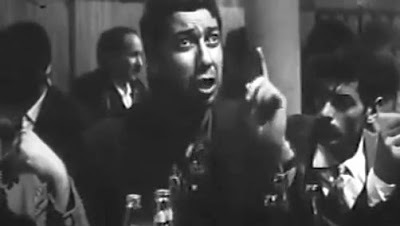 Since he has so rudely thrown away her beautiful dream, she tells him that he is only a coward and that they should break up. She asks him to take her to the orphanage to see the baby. In the 12-minute scene in the orphanage, Taji, on her own now, sees all the innocent babies there looking to play and be hugged, and she becomes increasingly despondent. This is an emotive and rueful scene suggesting life’s always hopeful beginnings and rarely fulfilled outcomes. Meanwhile outside on the city street, Hashem is alone and wanders past a TV store showing on the TV screens inside the same lettered man he had seen earlier in the day at the government offices. But now the lettered man is shown expressing the homily that the good life necessarily entails doing one’s duty to help his (or her) fellow man. Engage with your brothers, he is effectively saying. This is just the opposite of what he had told Hashem privately at the government offices. The closing shot shows Hashem driving away into the soulless urban darkness. When The Brick and the Mirror was released, it was not well received by either the critics or the Iranian viewing public . Nevertheless, I think it is an outstanding film. The wide-screen mise-en-scene of Golestan and cinematographer Soleiman Minassian has both an expressionistic presentation and an existentialist feel to it. One feels while watching it that one has been projected into a Dostoevskian world, where people eloquently, but naturalistically, make comments of philosophical resonance. There are a number of brilliantly conceived shots that linger in the memory. I have only mentioned some of them. For examples, there is one shot sequence during Hashem’s and Taji’s final argument in a narrow alley when they actually come to blows. But this is interrupted when they have to make way for a funeral procession of men carrying a coffin that brushes past them. There is another, three-minute, shot of them arguing in the taxi at the end. And, of course, the orphanage scene is haunting. Unfortunately, the visual quality of the version of the film that I saw was not of acceptable quality, and the soundtrack was not in sync with the visuals, either. It is my understanding, however, that the University of Chicago’s Film Studies Center has produced a digitally-remastered version of the film . Hopefully this version of The Brick and the Mirror will soon be made available to a wider audience. You can decide for yourself how that relates to what is told in this film. Jean-Baptiste de Vaulx, “Viewing Diary: Brick and Mirror (1965, Ebrahim Golestan)”, Cinescope, (1 April 2015). 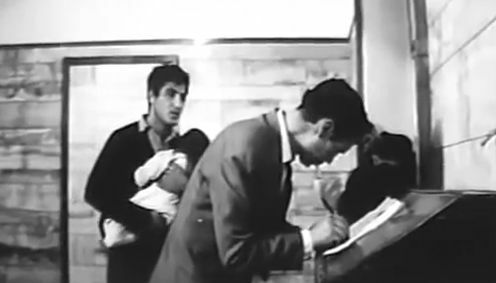 Parviz Jahed, “Directors, Ebrahim Golestan”, Directory of World Cinema: Iran, Parviz Jahed (ed. ), Intellect, Chicago. (2012). Ehsan Khoshbakht, “Brick and Mirror (Ebrahim Golestan, 1963-64)”, Notes on Cinematograph, (8 July 2016). Forough Farrokhzad had been married at the age of sixteen into an unsatisfactory household, and she had later obtained a divorce at the expense of leaving her small son with his father. She felt anguish about this lost motherhood for the rest of her remaining life. Harold Thimbleby, “Delaying Commitment”, IEEE Software, Volume 5 Issue 3, May 1988, pp. 78-86. “Khesht va Ayeneh (The Brick and the Mirror). 1965. Written and directed by Ebrahim Golestan”, Calendar, Museum of Modern Art, New York, USA, (24 November 2015). Ebrahim Golestan, “The Brick and the Mirror / Selected Answers from Ebrahim Golestan”, Sounds, Images, (Ignatiy Vishnevetsky), (7 May 2007). Phenomenal film. Thanks for the post.